The average American spends a lot of time away from home. Therefore, we hustle and maybe its too our detriment. Its long hours in the office and dizzying schedules outside of work. Most of us store the bulk of our preps at home, so what happens when a disaster strikes and we are pinned down by other responsibilities? What happens when we need to get home in a hurry? That is where the get home bag comes into play. We are going to look at 3 budget get home bags in this review. We aren’t looking to have a battle of which is best because we are bringing you three very different bags for very different purposes. The get home bag looks different for every person who carries it. If we haven’t used it we ain’t talkin about it. These reviews are being written for two implicit reasons that I want to be up front about. Why the Get Home Bag? As I mentioned in the opening paragraph we are away from home a lot. Consequently, we need a means of getting back home and to our preps in times of disaster or emergency. This is not laughing matter and can be quite the task for those who live far away from their workplace. What happens if your car suffers some damage? Maybe the roads you take home are impassable because of weather or damage? What happens if the way you get home on a regular basis is compromised? These things can happen due to any number of situations. Are your prepared to sit at your desk while your family faces down a serious disaster? If you don’t have a plan to get home in an emergency that is just the boat you will be in. We pack a get home bag to assure we have everything we need to get from our job to our base of operations or our home. As preppers we have legitimate bases of operations where we can sustain ourselves for some time in a disaster. Out in the world we are just as vulnerable as anyone else. So pack a get home bag and keep it in your car or workplace. Before packing a get home bag you have to sit down and understand what your get home mentality is. This is the unique part about this whole process, you see, some people work close to home and others commute hours a day. The get home mentality for those two extremes will be very different. If you work 5 miles from home you can walk there in a couple hours. If you work 50 miles from home you are talking about a day or two on foot, depending on when you leave and if you walk through the night. Because get home mentality can vary so much you have to really think about your personal solution. What does a safe route home look like and what is it going to take? You have to decide if your get home mentality is something like running a sprint or more like running a marathon. If your trek home is like a sprint you can carry much less and your get home bag will be lighter. There is no getting around the fact that a short distance walk home is way better than a long distance one. If your get home is a marathon, well, you have to consider lots of things. You are going to need water and calories for a long term bugout. Many people would disagree with the calories part but, trust me, you want calories in your bag. Eating is a much a mood booster as an energy booster. 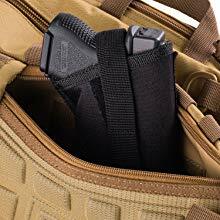 No matter where you fall I think a firearm should be part of your EDC or your Get Home Bag. I am also a huge proponent of gun builds. You can never know a firearm better than if you build it yourself and I would say America’s biggest gun problem is that we rarely seek to understand these weapons and their mechanics. Look at something like a 80 percent Glock and build from that base. There are videos all over the net on just this topic. Understanding your get home mentality is going to go a long way in this process of building a get home bag. So take the time, look at some maps and know what you are dealing with and more importantly what you are capable of. All the options below are bags I have owned and used in the field, hunting, camping, fishing or on a daily basis. The only way we can do reviews that you can trust is if we have used the products. You are going to see two options from 3vgear and that is because I really like 3vgear. I like the quality, design and the price of their products. Each of these bags is for a specific type of get home operation. This is not a competitive review to see which get home bag is best. Mostly because “best” is very different based on the individual and the task laid before them. I have to start with the Velox II for a number of reasons. The first being that its my personal get home bag. As I write this article its 29 degrees outside and my get home bag is sitting in the trunk of my car. It never leaves unless I need it and its been there for over a year. I love the Velox II because it has no idea what it wants to be! While it is outfitted for modular MOLLE use, all over, and would seem to know no bounds for light tactical operations it has a great laptop sleeve, too! The Velox II comes with plenty of organization for any admin or survival gear you are looking to store. Its made of 600D PVC backed polyester and like all 3v’s bags it comes with a lifetime warranty! Another interesting feature is that the Velox II is designed to also fit the Riparo Shield soft body armor by 3vgear. With one main clamshell pocket and a second large pocket you can fit a ton of get home gear in the main pockets of this pack. The smallest front pocket is reserved for FIRE in my back. Its a great little nook to just dedicate to fire starting implements. The larger front pocket is built for better organization. A great place for storing utensils, pens, pads, maps and one my favorite areas for storing tea bags! I like hot tea, so what! The Velox II also takes straps and padding seriously. You are getting a foam backed pack with great airflow and straps to match. The Velox II also conforms to your body with shoulder straps that connect at the breast and a waist strap to keep everything sturdy. Again, its my choice for a get home bag and with a few simple mods and organizers on the MOLLE you could easily turn this into a larger bugout bag. Easily one of the best bugout bags on the market the Three Day Assault Pack by Condor is a standout in the niche of larger multi compartment bags. The Three Day Assault Pack is the perfect bag for those who face the long distance get home scenario. If you know how to pack and survive on a little, you could live 5 days out of this 3 day pack. If your get home trip takes 3 days you should look for another job! Your killing yourself! This bag has the look and feel of a bag that means business. If you haul this thing into work you might get some funny looks. That’s your choice. It will do just as good in your trunk. Its built for organization and storage and even offers more finesse storage for things like documents, pens, maps and administrative items, than you might expect. The main compartment is massive and has straps to lock in equipment. This is a very cool feature for the main pocket. Its also hydration ready for up to 3L. Aside from the two main compartments, the Condor TDA pack also has two attached organizer pockets on either side with mesh pockets on each. There is also a larger compartment that sits beneath the main compartments. This is very helpful for organization and quick access to the most important items. The whole outside of the bag is MOLLE ready for even more storage. While this bag is built for storage and lots of it, it has also been made for long distance rucking. Lots of thought being put into the comfort of carry. The reinforced, padded straps, sternum buckle and waste straps are all adjustable and allow you to really tighten that load down to your body and command that load. Those of you who hike regularly know the importance of commanding that load. The foam back panel allows for airflow to keep you from sweating and losing precious fluids. The Condor Three Day Assault Pack is one of my top choices for a bugout bag. That said, it will give that long distance get home operation all the storage space, comfort and durability it might need. So if you are a day or even two days away from home, on foot, consider this bigger bag as a get home option. For me the Outlaw Slinger is the perfect option for an EDC bag. Aside from prepping I am also a work from home father who has two sons with me, most of the time. The EDC includes things far beyond the normal tactical loadout. Goldfish, books, clothes and of course hydration are all parts of this Dads EDC and go a long way with kids. That is how I use the Outlaw slinger but it is one of the best options on the market for the short distance get home bag. This hydration ready sling pack is built for rapid response to both threats and daily life. The stabilizing strap keeps the sling steady while you are walking long distances and its built of 600D pvc backed polyester which holds up against the best you can give it! I have been toting this back around for over 6 months and it has taken a beating. My lifestyle is non stop and this thing is on my back for all of it. One of the big reasons the Outlaw Slinger goes everywhere I do is because of its CCW compatibility. To me there is nothing like having my gun accessible in a hurry in all situations. If I cannot carry a firearm IWB this allows me to have it close by. 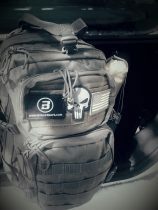 This bag is also compatible with the Riparo Shield soft body armor at 3vgear which means you can both shield your vitals and pull your weapon, at the same time, by whipping this bag around your front side. Beyond its compatibility as a CCW and self defense tool, the Outlaw offers comprehensive storage for all of your get home needs. Its also got a small laptop sleeve for smaller laptops. The Outlaw is my choice for EDC and the only reason it doesn’t follow me to work everyday is because I run a business from my own home. However, when I leave home I have the Outlaw on my back 9 times out of 10. The get home bag is not something to shrug off. Not only is it important in a disaster scenario its also part of a three tiered approach to EDC. It is one tier used to maximize preparedness outside of the home. We spend so much time away from home we have to take preparedness on the road, its critical this day and age because we travel further than ever before. Before you go buying bags or items, first consider your bugout mentaility and the situation you are in. Also look beyond work at the types of activities you drive to regularly. You may need that get home bag for those situations, too! Once you are confident in what you need you can use this article and the links therein to get yourself a tested bag that you can count on. I have one more little gift for you if you choose a 3vgear bag. Happy hunting and don’t forget to check out our nightly podcasts on prepping, self reliance and independence. I work 11 miles from my house. However there are three bridges that probably would not be safe to drive over after a major earthquake (South Carolina). An EMP/CME would have everyone walking. In addition to the 9mm carbine behind the seat of my pick up truck and a 9mm pistol, my bug out bag has first aid, water purification, two Army ponchos with cordage and a poncho liner for warmth. Two days of freeze dried food and propane camp stove. I kept it light intentionally. If I cannot safely walk down the road, the railroad tracks is alternate one. Gas pipeline is alternate two. Told my wife to shelter in place. If things are calm, I will be there in two or three hours. If people are shooting at me, it will take longer, since I will be moving slower. Every person will have a different situation, and must plan realistically. I love it! I love that the get home is so unique to each person. I would love to know your gameplan for crossing those bodies of water.